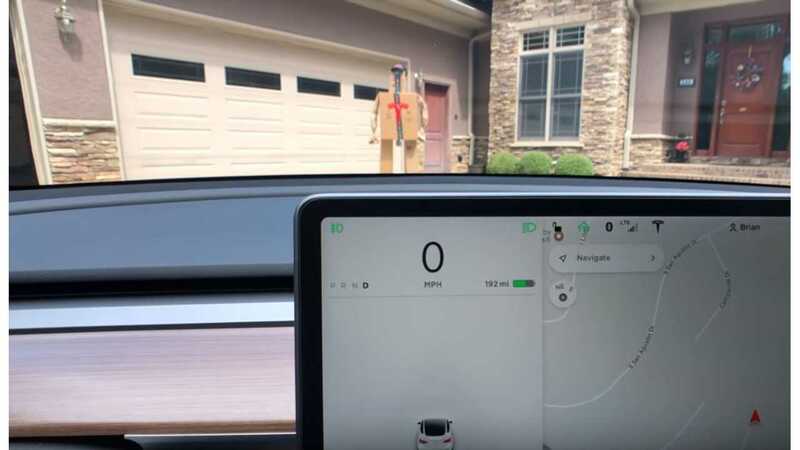 Will Tesla Automatically Stop For Cardboard Box Man? Everyone knows Tesla Autopilot doesn't stop for cardboard boxes! Slow news day? It turns out, YouTuber i1Tesla is well aware of these type of tests and previous results. He even starts the video by saying he has no clue what the outcome will be with his Tesla Model 3. However, with a multitude of Tesla Autopilot updates over time, it's interesting to keep tabs on what might happen. About three years ago, Bjørn Nyland tested a Tesla's automatic braking feature against a styrofoam wall with Autopilot engaged. We shared a recent video using a fabric car, but that was specifically a test to see what may happen when a Tesla driver is following another car and the car suddenly leaves the lane. Our friends KmanAuto and Mike Anthony have tested Tesla pedestrian detection more than a few times, although they actually used real pedestrians (not something anyone should be attempting). Following the tragic Uber crash, another channel tried a very unscientific simulation with a cardboard cutout. The list goes on and on. In this most recent video, i1Tesla tests the automatic braking feature on the Tesla Model 3. In the first test, he doesn't use Autopilot, simply to see what the car will do if a person is completely in control. The second test shows how the car's Summon feature handles the cardboard Tesla fanboy. Finally, the third test is performed with Autopilot engaged. You might be rather surprised at what he finds. Watch the short video in its entirety to learn about the details.